Water Snowflake is a pretty, fast-growing, perennial water plant. A blooming colony indeed looks like snow-flakes on water. It has flat, rounded, floating leaves, and delicate white and yellow flowers appearing in summer. Water snowflake has white flowers with yellow centres. The petals have unusual, feathery edges. 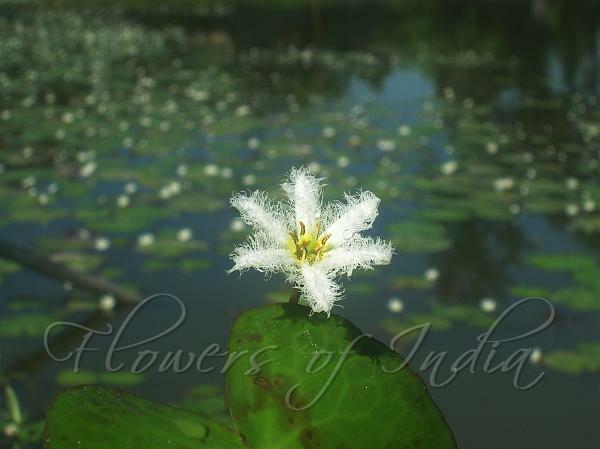 The flowers are formed above the floating leaves with 2-4 cm long stalks. It gets its common name, of floating hearts because of the heart-shaped, bright green leaves which lie on the water surface like those of water lilies. Although they bear some resemblance to water lilies, they are not related. New plants are formed all the time where the floating stolons (above-ground, modified stems) form tufted plantlets along their lengths. The mother plant has a short, thick stem which is rooted in the mud at the bottom of the pond. In its natural habitat the plant may be subject to periods where the water may dry up, in this case it forms roots at the nodes to help it survive.